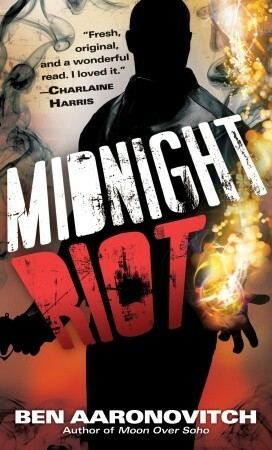 Midnight Riot is a great new book! Peter Grant is a young probationary (rookie) police constable with the London Metropolitan Police Department. He’s on schedule to be assigned to hard desk labor when a man is killed by decapitation. Peter and a fellow officer are stationed at the murder site to keep it secure when he is approached by a ghost who has seen the murder take place. This interaction brings him to the attention to the Detective Chief Inspector Thomas Nightingale and Peter is subsequently assigned to Met Police’s version of the X-Flies. The crime witnessed by the ghost turns out to be the first in a long string of horrific deaths that Peter and Chief Nightingale investigate – and Peter is introduced to a world of magic, gods, and spirits that he’d thought were only children’s tales. I really, really enjoyed Midnight Riot. The primary character’s voice (Peter Grant) was fresh and new – he grabbed my attention within the first few paragraphs and never let it go. The author’s take on the magic system was very original – as a dedicated fantasy reader I appreciate that – and I loved the fact that Peter is a mixed race young man. It’s unusual to have a minority or mixed race person as a primary character. I also enjoyed the fact that there was a strong cast of secondary characters that all felt well fleshed out. The story starts off very simply but quickly turns complicated. There are twists and turns that I did not expect but I thoroughly enjoyed. The deaths that occur are brutal and violent but the author does not dwell on the actions in a way as to make them gratuitous; they feel very necessary to the plot and they are not described in a way as to turn a reader’s stomach. Peter Grant’s character is engaging and his sense of deprecating humor runs through the entire book. The only issue I had with Peter was located behind this spoiler: Hover your cursor over this sentence if you’re sure you want to read this spoiler. I had very few issues with this book. The only things that bothered me was a lack of a map – US and other readers not familiar with London will have a bit of a problem following certain scenes that are geographically based – and some of the London English vs. American English slang and abbreviations. Most of the slang is not explained (which required some googling). These were rather minor problems that did not impede my enjoyment of the book at all. This is a VERY solid first book! I’ve already purchased the follow up novel, Moon Over Soho, and I will more than likely pick up a copy of the third book when it is released.